Melinda has been a horse fanatic from the very beginning. 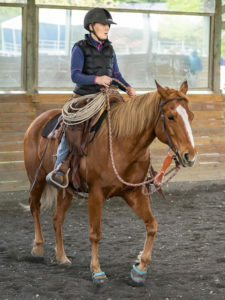 She convinced her parents to buy her a Morgan gelding when she was 9, and spent her formative years immersed in the Snohomish County 4‐H horse program. In 2003, she started a job at a dog and cat shelter and consequently fell in love with animal rescue. That job eventually led her to realize that her calling in life was to be a veterinary technician, and she obtained her license in 2008. Her goal as a vet tech was to become involved in equine medicine and small animal shelter medicine, and she has built her career around both of those passions. 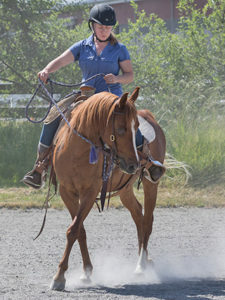 She started out at an equine hospital in California, then became homesick and moved back to Washington where she worked in an ambulatory practice and as an equine surgical technician at a large referral hospital. Several years later she moved away from a career with horses after being offered a position at an animal shelter. 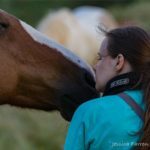 In an effort to remain connected to equine medicine, she approached SAFE in September 2013 to volunteer her time as a vet tech to help with whatever medical care was needed. 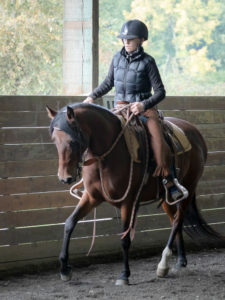 She also took on a weekly feeding shift and then started working with the horses as a volunteer rider. She stepped into the role of Herd Health Manager in 2015. Melinda is responsible for overseeing the day to day medical care of all horses under SAFE’s care. She works closely with our veterinarians, coordinating all routine and emergency care. On any given day you can find her doing such tasks as devising feeding plans, treating a wound, or out in a field taking vital signs. In her spare time, Melinda enjoys being in the great outdoors with her husband, Chris, and their cattle dog, Karma. She also volunteers as a vet tech at the same animal shelter where it all began.